The rover mission marks the world's first moving, robotic observation of an asteroid surface, according to the Japan Aerospace Exploration Agency (JAXA). "Each of the rovers is operating normally and has started surveying Ryugu's surface," JAXA said in a statement. Taking advantage of the asteroid's low gravity, the rovers will jump around on the surface—soaring as high as 15 metres (49 feet) and staying there for as long as 15 minutes—to survey the asteroid's physical features. "I am so proud that we have established a new method of space exploration for small celestial bodies," said JAXA project manager Yuichi Tsuda. Hayabusa2 will next month deploy an "impactor" that will explode above the asteroid, shooting a two-kilo (four-pound) copper object to blast a small crater into the surface. 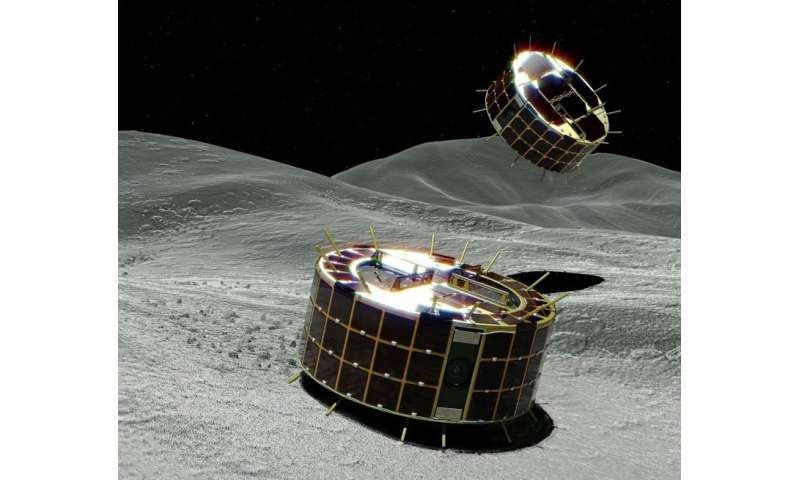 Hayabusa2, about the size of a large fridge and equipped with solar panels, is the successor to JAXA's first asteroid explorer, Hayabusa—Japanese for falcon. Major accomplishment in Space Exploration. Everyone involved on the assorted project teams deserve major kudos! A small asteroid with an atmosphere? Incredible or incredulous? Eventually someone needs to take the editor of these articles aside and gently explain the difference between "air" and "vacuum". There are vacuums and there are vacuums, and a poor vacuum is closer to atmosphere than a high vacuum with kilometers of mean free path. At 100 mPa poor vacuum and room temperature, MFP is a few tens of millimeters. Please to excuse my translation of atmosphere to 'air'. Domo arigato. Eventually someone needs to take the editor of these articles aside and gently explain the difference between "air" and "vacuum"
Eventually someone needs to take willis aside and gently explain (bitchslap) the difference between "metaphor" and "STFU"
D_N, your comment seems a sensible rationale. Except, what evidence is there that the asteroid 162173 Ryugu has any detectable atmosphere/air? As a Cg type asteroid it is theoretically possible that it's composition can outgas. But, considering it's known, present orbit? The odds are that any ices close enough to the surface sublimed a long time ago . Smacking the rock with a couple of impacters could expose some ice pockets. Releasing fumes. Occasioning this small flying mountain a temporary thin atmosphere. Until the Solar Winds puffs it away.